Thanks for music and for mention about festival. If you will be there, it would be interesting to know your opinion about perfomance and organization. At all - it's good idea to collect information about good african festivals in Europe (It seems, there is now such source in the net). Wow. Thanks for that. I like that kind of angolian music a lot. With a the intro of the first song it starts as a cadence des antilles record. the light keyboard parts from the title track feel as beguine from martinique. The carnaval song has the horns from cadence. The others are more pure semba. Very very nice album - I love it now. I noticed the inclusion of Culture Musical Club in the Afrikafestival program, and that reminded me of a question I've been meaning to ask. You have produced a series of truly stunning podcasts, which I have enjoyed immensely. Would you have the time or inclination to put together a Taarab p'cast sometime in the future? Given that taarab is generally overlooked, I don't think anyone would complain. Thanks for all. @Anonymous(a.k.a. Joe): A taarab podcast sounds like a good idea. I'll work on it, i.e. I'll gradually collect some tracks to put it together (so it may take a couple of weeks). 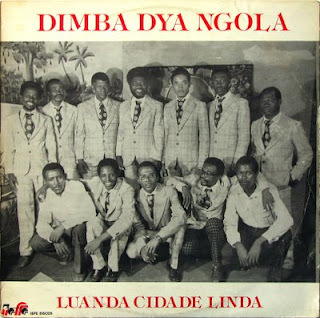 I have recently been on a personal respective dig into my Angolan albums and loving once again what I hear, but I have never heard or seen this one before. I love the guitar stylings in particular. Although every song on this album is wonderful,the first 4 songs have been played in my house many times now. for one reason or another i can not download this file anymore.Love Angolan Music any possibility u can post it again? by the way great blog, really enjoy it. @Anonymous (the last one): The link has been restored.